Starting to sell your art as prints for people to hang on their walls is a fantastic way of getting your art noticed while making some money. Marketing tees and apparel is one thing – you can create lifestyle photography, use your friends as models and walking billboards, create style guides, etc. But how do you sell your art in an engaging way? Problem: Just like some people prefer tri-blend to normal cotton tees, people also prefer different kinds of wall art. Solution: There are some super fancy ways you can do this, like offering your art on metal or plexiglass or dinosaur bone (that’s not a thing). But you don’t have to get too crazy with it. 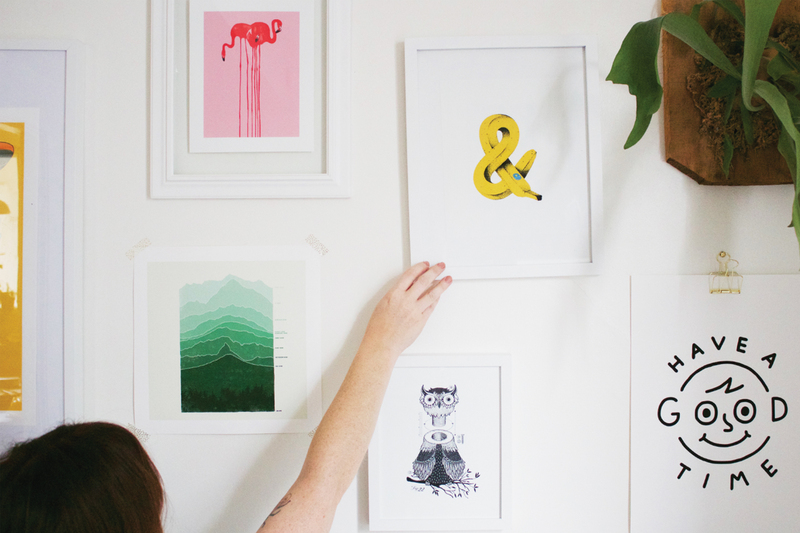 Offering both paper wall art prints and stretched canvas in a wide variety of sizes like you can do with Artist Shops is a simple way of offering a few different types of wall art while also keeping it affordable. Problem: It’s easy to think that unless you’re buying a cheap-o poster, covering your walls with art is gonna cost you a paycheck. But art on prints/stretched canvas is high quality while still being comfortably affordable. And that’s important secret to let your audience in on! Solution: One way to alert people of this is to offer art both framed and unframed, cutting out the extra cost (and effort) of going out and finding frames for your prints. You can also use content marketing to do this, offering DIY posts like “How to Display Un-framed Wall Art” (like using clothespins or alligator clips), or “How to Make Your Apartment Artsy Chic Under $100 Dollars,” etc. Problem: Sure, having an online store is great. But you’re selling wall art – it’d be cool to sell your art while it’s publicly displayed on walls, right? Solution: There’s an episode of Broad City where one of the main characters has her art in a “gallery show,” which ends up just being a sandwich shop displaying her art. Besides being a super funny episode, it’s also accurate: almost anywhere can be turned into a gallery. 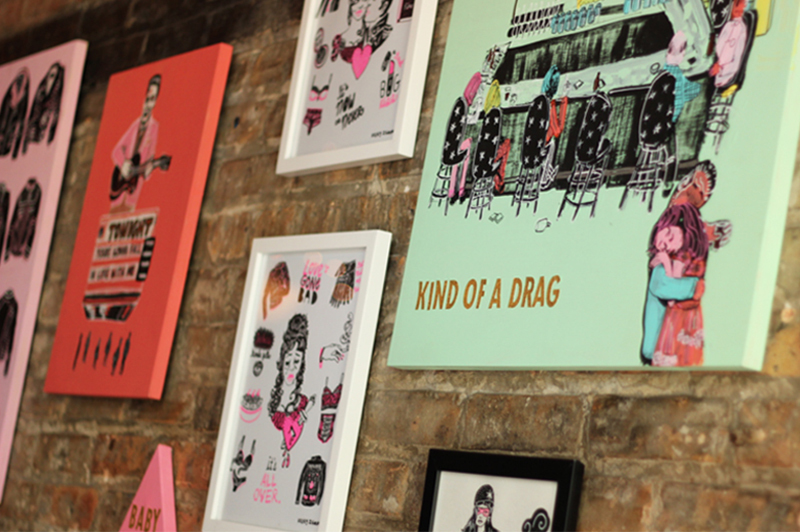 Displaying your wall art in a coffee shops/bars/alternative gallery shows that attract the audience you’re looking to attract isn’t the best way of getting a ton of money flowing in, but the goal here is exposure. Include business cards with your name and social media handles so that people can explore more of your work at home, and offer your work already framed for the venues you want to display it at. This is also a great way to build email lists at opening/closing gallery show receptions. And hey, when you can get a few IRL sales along with exposure? It’s a win-win. Problem: We all know that posting “BUY MY ART” on social media never works. So how do you market and sell your art on social media in a non-sales-pitchy way? Solution: If you look on most companies blogs (including Threadless), you’ll see that the posts aren’t just pushing people to buy things, but rather offer creative, share-on-Facebook-worthy content. Offering content that connects with people and offers them something too rather than just a product is key with content marketing. I recommend starting a blog to give your content a home, or writing guest posts for sites and blogs with an audience you want to reach. It can be as simple as putting together a “How to Make Rad Patterns” post featuring WIP work of a pattern you offer in your shop (if patterns are your thing), or the DIY décor posts I mentioned in #2. 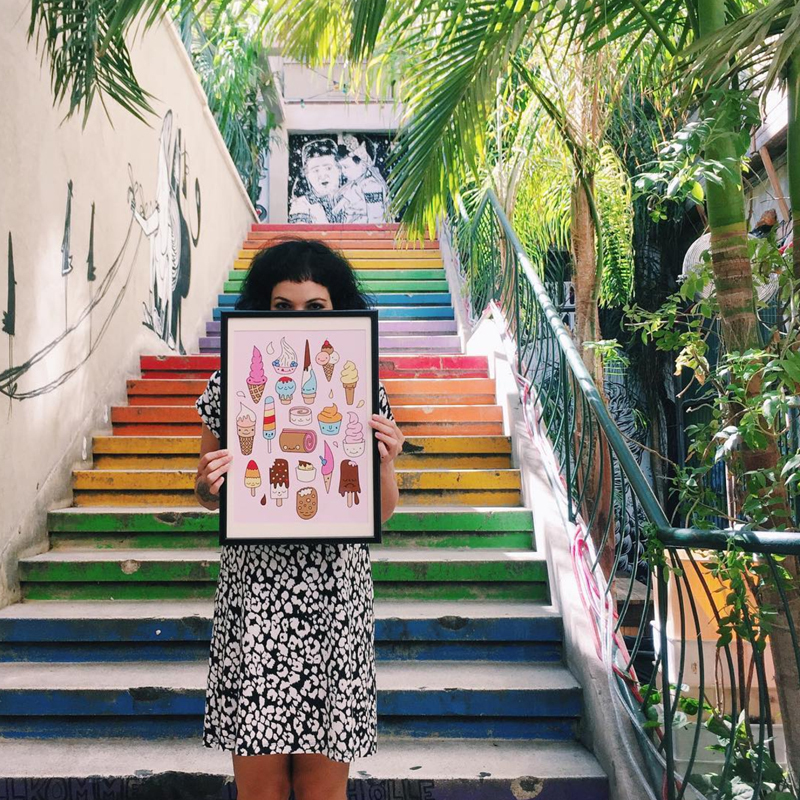 Check out these creative content examples from Threadless, Urban Outfitters, and Society 6. Problem: Maybe you’re not the best writer, or maybe you’re a great writer but your blog/content isn’t getting the attention it deserves. Solution: Don’t be afraid to cold email lifestyle bloggers, Instagrammers, social media personalities in your niche, etc. who have a similar audience to your own to see if they’d like to collaborate with you. Offer to send them a free collection of wall art from your shop (and with Artist Shops, order those samples at just the base fee) if they write a guest blog post about it and take some photos. Threadless did this with Foxtail and Moss, who created a gallery wall and DIY guide for the Threadless blog that they also shared on their own site. It’s great cross-exposure and expands your audience. The problem here is that all films need room decor for their sets. The solution could be your art. It may be a bit of a stretch, but it’s by no means impossible to get your art featured in films or as art for a band or show. Tara McPherson got a huge boost when a few of her designs were selected to be in Juno (the art directly behind Ellen Page in the image above). And Jen Mussari did the same when Amos Lee hired her to create their album art. Reach out to indie filmmakers, local or growing musicians, even friends who are indie filmmakers and musicians, to see if you can collaborate a little bit and cross-promote your art, or maybe do limited edition art for their film/album/concert that will then be sold with the profits split up. It’s worth a shot! Make sure too that your art is protected from jerks who would want to steal it for their films. Check out this story for more deets. Problem: When you display and sell your art in local venues only, your audience is a little narrow. Solution: This may be a given, but starting an online shop for your artwork is all but crucial nowadays. It makes your work more accessible and expands your audience – it can only help you in getting exposure and snagging sales. Problem: mock-ups of your art as prints and canvases are ok…but they don’t really show off the quality of the prints, nor do they sell a lifestyle. Solution: Take awesome photos of your wall art. Use your own home and space as a canvas for gallery walls, by taking your prints to the streets and taking pictures of them in cool areas or against cool backgrounds, etc. Quality photography of your prints is key – it draws the eye to social media posts, completes content and makes it engaging, and shows off the product’s quality. Quality of photography can make or break interest in your product and sales – don’t pass up having great shots of your work. Problem: How do you actually utilize social media to sell your products? Solution: In this case, Instagram is a good platform to run with. Instagram is a visual medium – a fitting place to sell your wall art. PetaPixel and Forbes reported a story about a photographer who made $15,000 overnight by offering his photographs for $150 for one day only. While this photographer already had a healthy following, it’s a good example of how to use this platform creatively. Run flash sales like this, posting a great lifestyle photo of your displayed wall art and offering prints at a certain price for a limited time, or limited edition prints that will be taken down from your site after a certain date/time. You’ve seen “link in bio” before – include your online shop link in your Instagram bio so that people always know where to find your stuff. Problem: You can only display your art in your bedroom or living room so much before the location gets old. You want to show it off in different places. The solution: Your friends and family are great resources. Ask them to buy some of your prints (give ‘em a discount) or even provide the art yourself and ask if you can take some pictures of it in their cool space. Or, if they hang your wall art, ask them to share photos of it on social media. The photo of that pillow, for example, was taken in a friend’s apartment! If you want to sell your designs in an online shop but have been too nervous about the cost of products – especially when they go unsold – then Artist Shops are perfect for you. With Artist Shops, we handle all of the manufacturing and shipping, giving you flexibility to experiment with what designs and marketing techniques work for you with none of the risk. A risk-free learning curve. Open a Shop right now! I had some art up at a local coffee shop and never sold any so I took my artwork down, but after reading # 3, I’m wondering if I did the right thing. I thought because people who come into a coffee shop probably wont happen to have art buying on their minds especially for hundreds of dollars. You make a good point, it probably was helping me with exposure. Perhaps instead of just original pieces at a coffee shop I could mix in some prints to offer a more affordable option. Come check out my artwork at: https://ivybath.com -Thanks! Your work is beautiful. Love the color combinations! 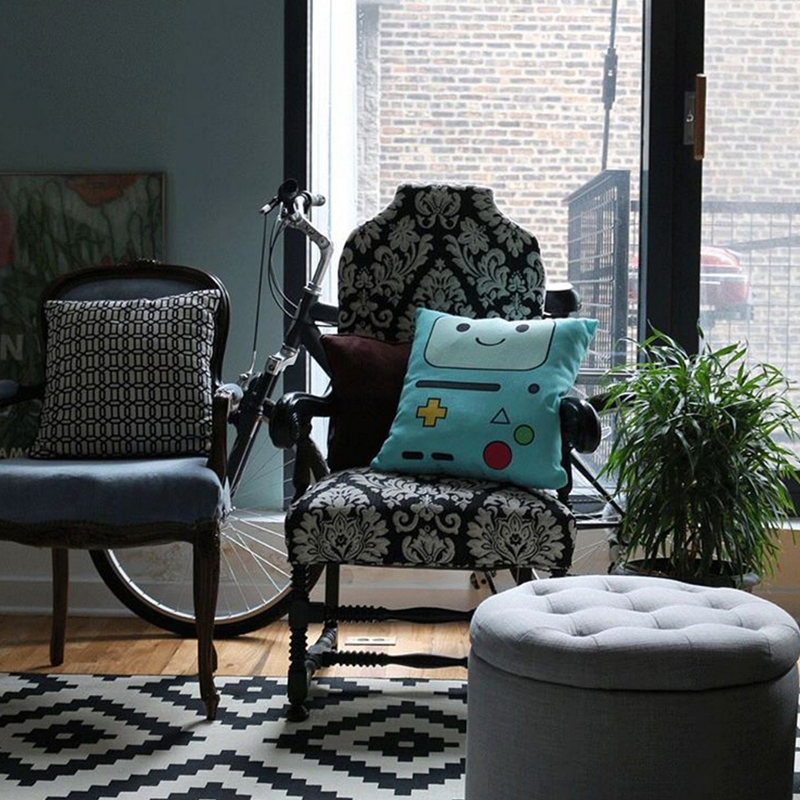 Awesome selection of rooms to showcase your art in situ–plus the ability to frame! Great post, the tips that you share in this post to sell your art outside of a gallery is really amazing. I really like the way you explain each and every point in details. This post is really very informative and helpful to every artist who wants to sell their art. Wow, it’s interesting that you talked about the different ways to be able to sell art online, as there are a lot of challenges involved such as looking for the right people to buy an art piece, scheduling updates so that people can expect when to see the art that you’re selling, and so on. One neat example of being able to sell your art is by having a physical venue where people can appreciate the art pieces hanging on the wall and add a pretty touch of flair and color to the place where it’s serving as a wall decoration. I’m looking to be able to sell some landscape paintings, so the tip of having to go to a coffee or a hobby shop to hang up the art for display sounds like a very good idea!